Kelli ordered the Chicken Vesuvio, which the Chicago Tribune named the best CV in the city. 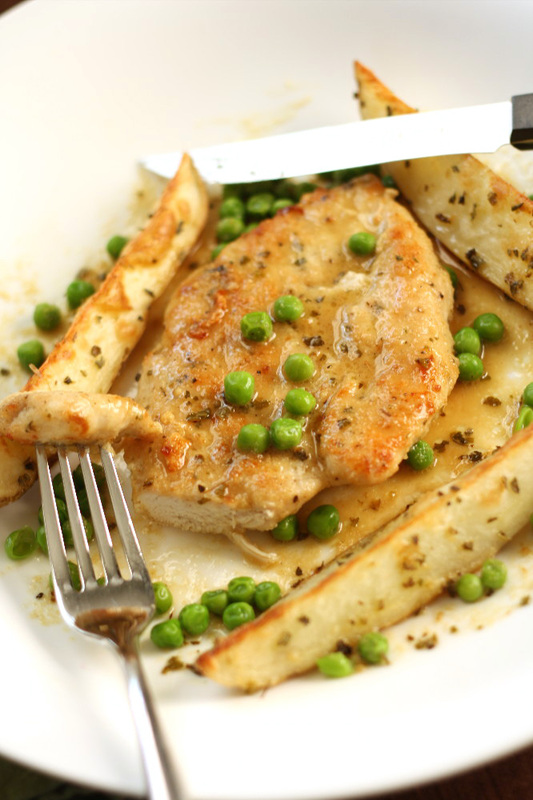 Chicken Vesuvio is a Chicago-born Italian-American dish. The chicken is usually braised … browned on the stovetop and before being finished in the oven. 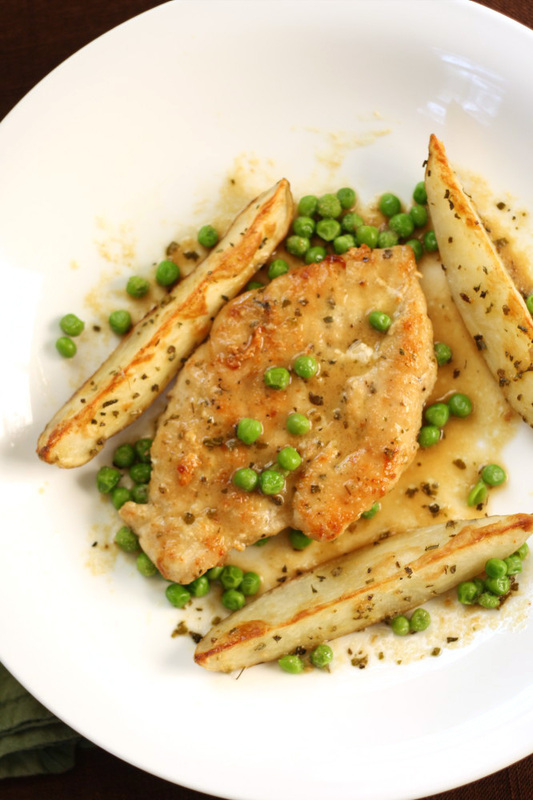 It’s done with a sauce of white wine and spices, paired with roasted potato wedges, and frequently garnished with green peas. The Chicken Vesuvio at Harry Caray’s (which has a great gluten-free menu, by the way) was out-of-this-world good. Thank goodness the restaurant portion was large, so there was enough for Kelli to share with yours truly. My Caesar salad paled in comparison. When in Chicago … order the Chicken Vesuvio. Lesson learned. For our version, we simplified the preparation by foregoing the oven and doing the chicken entirely on the stovetop. Otherwise, we’ve tried to do justice to this Chicago classic. 1. Preheat your oven or toaster oven to 400 deg F.
2. Cut each large Russet potato into 6 long wedges and place in a baking tray. 3. Coat the wedges in olive oil and arrange them so they are wedge-side up. 4. Sprinkle lightly with salt, then a dash of lemon juice, then lightly with dried oregano and garlic powder. 5. Roast for 45 min to 1 hour, until golden brown and soft. 7. Add the chicken broth, white wine, garlic, and oregano to a skillet. Bring to a boil over high heat and reduce the sauce for 10 minutes. 8. Add the butter, turn the heat down to medium, and cook for 2 more minutes. 9. Remove from the heat and add back the chicken. 10. Plate 1 chicken breast and 3 potato wedges per serving. Garnish with green peas. For the flour dredge, you can use most any gluten-free flour or all-purpose GF blend. For a saucier version, double the sauce quantities. This recipe is: gluten-free, peanut-free, tree-nut-free, fish-free, shellfish-free, soy-free, yeast-free, refined-sugar-free. Per serving: 570 calories, 15g fat, 37g carbs, 60g protein, 770mg sodium, 2g sugars, plus 1,470mg potassium and at least 140% RDA niacin, at least 90% RDA vitamin B-6, at least 60% RDA vitamin C and selenium, at least 50% RDA phosphorous, at least 30% RDA magnesium and manganese, at least 20% RDA iron and thiamin, and at least 10% RDA vitamin B-12, copper, folate, riboflavin, and zinc. It’s a keeper for sure! Yum! Hi Rhonda… So glad you enjoyed the recipe! So yummy! I made this tonight and my family all agreed that it was restuarant quality. My daughter, age 11, pretended to be a “food critic” and could find nothing wrong with the dish!